Oh my! Where did October go?! The leaves are almost all gone and it's turned frosty in the mornings. The days are getting shorter. Our internal clocks are in a state of confusion thanks to Daylight Saving. 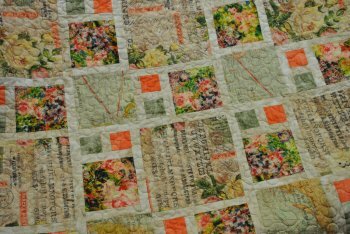 It's time to start quilting. We have a lot that's been happening around the Shop. 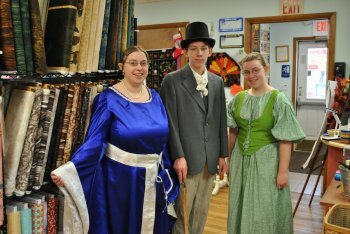 On Halloween, we had a 25% Off Sale on almost everything in the Shop and a Halloween Costume Contest. We would like to congratulate Ruth D. on winning a $25 gift certificate. She made her elf costume and her daughter, Anne, costume. Keith D. gathered different clothing to make his costume. It was a very tough decision. Here's a photo of our Winner and companions. 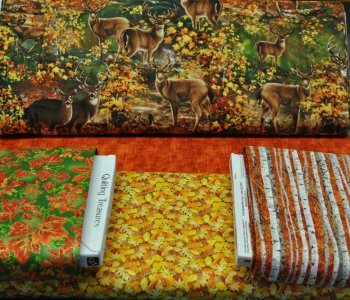 We just got in some beautiful Fall, Winter & Spring themed fabrics. We have a beautiful Deer and orange blender in. We've added a few Fall fabrics that we already had in stock to inspire a possible table runner, throw or wall hanging. I hope you are feeling inspired! Don't these colors just pop out at you? Here is a beautiful country themed collection that reminded us of our area. It reminds us of a slower paced era. There are more photos of this collection showing more combinations of using these prints together on our Facebook page. They just seem to go so well together. The photos don't do them justice. 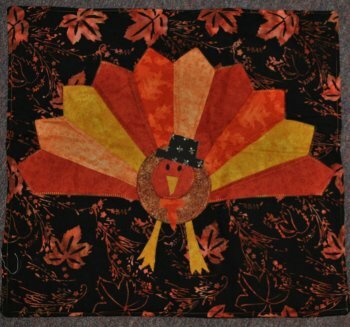 Saturday, November 7th 10a-2p $20 Thanksgiving Turkey Wall hanging. little turkey to brighten your Thanksgiving. 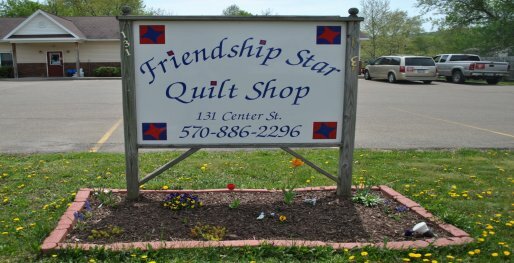 Saturday, November 14th 10a-11a Free Demo and Pattern. out as soon and Mom has something to photograph. a cute little throw. I should be able to get a photo out to you in a few days. We are going to experiment on all of you. (evil laugh) Starting in November, we will be sending out a short email to make everyone aware of any weekly sales that are going on in the Shop. It's our belief that many of you are unaware of our sales because you don't get the local newspapers. Therefore, to make sure everyone is kept informed, we will let you via email whenever we are having a sale. We do, however, have a Show and Tell this month! 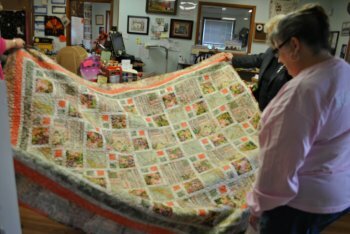 This quilt was made by Elizabeth G. (not our Liz) and it shows you how not to be afraid of big prints. This quilt is absolutely beautiful. The photos really do not do it justice. This quilt is amazing! Look at all those big prints she used! We hope everyone had a great Halloween and were able to enjoy all the little vampires, Elsas, Anas, stormtroopers, and super heroes that came knocking on your door. Have a wonderful week, enjoy the Indian Summer that promises to hang around for a few more days at least.